Note that some kit clubs require a subscription, the one I’m subbed to at the moment requires a six month subscription. Please note that if you are watching a design team member’s video, you will most likely not receive everything they receive. Most kit clubs have “add-ons” which are additional mini-kits that you have to purchase separately. I made the mistake of thinking I’d get everything I saw in a design team member’s video once only to learn that I’d have to have bought three add-ons in addition to the main kit before I received all of the product shown. The main kit is always a lot less than what the design team members show and very rarely do they tell you that up front. *Some of these kit clubs will sell you their kits once their subscriptions have been filled. However they are sold on a first come, first serve basis and some sell out very quickly. Button Farm Club – The Button Farm Club offers two monthly kits, a scrapbooking kit and a mini album kit. I prepared a detailed review along with pricing, photos and a video review here. Citrus Twist – Citrus Twist offers one main kit a project life kit and a stamp kit and add-ons. The pricing is a little confusing, without logging in they show three prices for their main kit ranging from $30.50 – $35.00 and for the project life style kit the prices ranged from $19.50 – $22.00. Their stamp was $4.25 – $5.00. There terms are long and confusing so I will just link to them here. Clique Kits – Clique Kits offer one monthly scrapbooking kit. Kits are $29.99 for subscribers and $34.99 for non-subscribers. You can cancel with 30+ days notice. Cocoa Daisy – Cocoa Daisy offers one main kit (with add-ons) and a project life style kit each month. Cocoa Daisy requires a six month subscription and although you can cancel, you must pay a cancellation fee. The monthly price is $29.95 for subscribers and $32.95 for non-subscribers. Club Scrap – Club Scrap offers three kits, a deluxe scrapbooking kit, a basic scrapbooking kit and a stamp kit. The deluxe kit is $34.95, the basic kit is $19.95 and the stamp kit is $21.95. I was unable to find any information on their website regarding their terms and cancellation policies so before signing up, I would recommend emailing them and asking them directly. This really is something they should have on their website. Gossamer Blue – Gossamer Blue offers one main kit, a project life style kit and a stamp kit plus add-ons. Gossamer Blue kits include some exclusive Gossamer Blue product, as they now manufacture their own product. Gossamer Blue is a noncommital kit club – you can cancel at any time with no cancellation fees. The price is $29.95 for subscribers and $34.95 for non-subscribers. Noel Mignon – This kit club is the MAMA of all kit clubs! It is more expensive than the other kit club’s main kits but it is packed full of product. This kit club has a six month subscription requirement and they only open for subscriptions twice a year. (You can email the owner to try to get a spot which sometimes becomes available but is not guaranteed) They open for subscriptions in December and May. The main kit is $59.99 and the project life style kit is $32.99 for subscribers. There are no add-ons or extra charges other than shipping (because the kit is so packed full of goodness that you don’t need add-ons!) You can purchase the kits (if there are any left over) each month in the store for $64.99 for the main kit and $34.99 for the project life style kit. There is a $25 early cancellation fee, due to the significant savings per month as a subscriber. Subscribers save $6 per month on the classic kit, $5 on the Daily Diary, and $11 on the combo kit. That is a savings of $36, $30, and $66 for the full term of kits. Paper Bakery – The Paper Bakery offers five types of kits, a scrapbook kit, a project life type kit, a project kit, a card kit and a mixed media kit. The scrapbook kit, project life type kit and the card kit are all $25.00 for subscribers and slightly higher for non-subscribers. The mixed media kit is $30.00 and the project kit is $36.00 for subscribers and slightly higher for non-subscribers. They also offer several add-ons. They offer a six month subscription membership with a $20.00 cancellation fee. Paper Camelia – Paper Camelia is another noncommittal club, you can cancel at anytime with no fees They offer a scrapbooking kit and a project life style kit with add-ons. Price is $29.95 for subscribers and $34.95 for non-subscribers. *NEW* The Paper Loft – I can’t find a lot of information on their website but they appear to have a scrapbooking kit as well as a mini album kit. I’ve written to get more information and will update this post when I receive it. Scarlet Lime – Scarlet Lime offers a mixed media monthly kit and an art journaling kit. The mixed media kit is $29.50 for subscribers and $34.50 for non-subscribers. The art journaling kit is $31.00 for subscribers and $36.00 for non-subscribers. I was unable to find any cancellation terms so before signing up, you may want to email them to find out if there is a fee or not to cancel early. Scrapbook.com – Scrapbook.com offers a monthly scrapbooking kit that costs anywhere from $35.00 to $61.50 depending on the month and the kit. Right now ALL of their kits are on sale for $35.00. You do not have to subscribe, you can purchase the kit whenever you’d like on their website here. Scrapbook Circle – Scrapbook Circle offers a monthly scrapbooking kit with a two+ monthly subscription or you can purchase the kit outright from their site with no subscription (provided they are not sold out). If you subscribe, you can cancel after the second month with no fees. The price is 29.50 for subscribers and 34.50 for non-subscribers. Scraptastic – This is a noncommittal kit club meaning that although you have to sign up for a monthly subscription, you can cancel it at any time. One thing I like about Scraptastic is that there are two monthly kits you can choose from in addition to a project life style kit available. The price is $25.00 and $28.00 for non-subscribers. Creative Retreat – Creative Retreat is an embellishment kit which is under new ownership since I first published this post. It is now subscription based and the price is $16.99/month. Elle’s Studio – Elle’s Studio offers more of an embellishment kit each month that does not require a subscription. You simply purchase the kit from their website. The kit price is $11.99. Freckled Fawn – This is an embellishment kit and the price is $34.95/month. They have a small cancellation fee if you cancel prior to six months. FYI, Studio Calico has raised their prices and had added a planner kit. RE: Studio Calico has changed their cancellation policy too. It’s a lot more than $15. I have updated the info to include their newest cancellation policy. Thanks for the heads up. LOVED this info! Hubby is going to shake his head at what I just spent. Great post, again thank you for compiling it! Thanks Kat for sharing this info. I have thought of joining a scrapbooking club but because I already have a “lot” of my product from store purchases, I always hesitated from doing so. Your info was VERY helpful as I had no idea these subscriptions worked in this manner. I really appreciate that you’ve broken this info down for those of us who had no idea what was involved in joining a Kit Club. I really appreciate this info and will definitely subscribe to your blog. The Stamps of Life also have 3 monthly subscription kits..there is a stamp kit, a diehard kit (which includes the stamps from the stamp kit + a coordinating die(s), and then there is a card kit club..each I believe require a 3 month minimum commitment. Which one would you recommend? 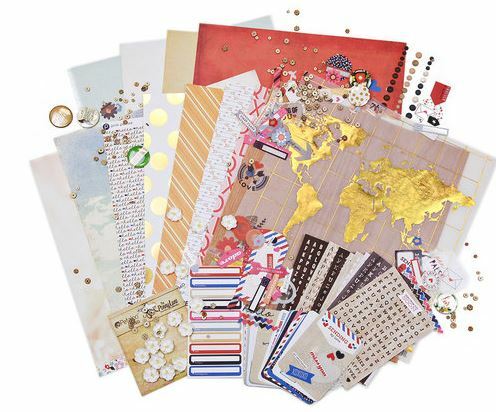 I am looking to give as a gift to someone who loves scrapbooking. Thanks for this post and for updating it! Do you know if any of these clubs come with detailed instructions? I would love to know if you know of any great sites to purchase scrapbook page kits – kits with detailed instructions and all supplies needed for those certain pages. I of course am not wanting basic pages – I am wanting very elaborate pages. Thanks for any help! Another great monthly kit club company is Quick Quotes! They offer more than one monthly option with a 3-month commitment. Love their product!